(Nanowerk News) Climate protection and the reduction of carbon dioxide emissions have been on top of global development agendas. Accordingly, research and development projects have been conducted on national and international levels, which aim for the improvement of the CO2-footprint in diverse processes. Apart from particularly energy-intensive sectors of the industry, the building sector in particular is among the biggest CO2-emmitters: from residential homes, manufacturing facilities and storage depots to big commercial buildings, about 40 percent of the energy consumption within the EU are due to the heating, cooling, air conditioning and lighting of buildings. Considering next-generation smart windows and façade devices, one aspect of this problem is addressed in the research project Large-Area Fluidic Windows (LaWin) which has been coordinated at the Friedrich Schiller University Jena, Germany, since 2015. 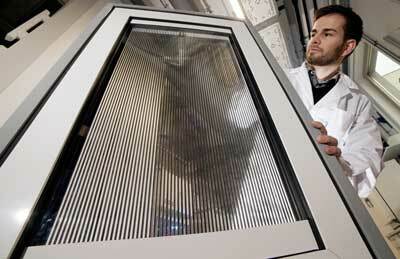 A new type of such smart windows was now presented in the upcoming issue of ‘Advanced Sustainable Systems‘. In their paper in Advanced Sustainable Systems ("Large-Area Smart Window with Tunable Shading and Solar-Thermal Harvesting Ability Based on Remote Switching of a Magneto-Active Liquid"), the Jena materials researchers introduce prototypes of a window that changes its light permeability at the touch of a button, and, at the same time, can be used for solar-thermal energy harvesting. The subject will be featured on the title page of the journal. The efficiency in terms of heat gain per area is comparable with that of state-of-the-art solar thermal facilities. But unlike those, the present system can be readily integrated in a vertical façade. Switching between on and off – the release or capture of particles – happens in a separate tank. An electrical connection at the windows is not necessary. “The greatest advantage of large-scale fluidic windows is that they can substitute air conditioning systems, daylight regulation systems and for instance warm water processing,“ stresses Wondraczek, who holds the chair of Glass Chemistry at the University of Jena. Developing cost-effective large-size window glass modules is key. On the one hand the glass elements need to include the channels, on the other hand they maintain their performance over the whole lifespan of the building. Finally, they have to provide the ability for integration with standard window manufacture technologies in frames of double or triple glazings. With the present prototypes which were manufactured on a scale of around 200 square meters, the research consortium demonstrated that those requirements can be fulfilled.